Strummed and picked on the guitar and ukulele, along with singing and whistling, the 11 songs on this album draw from prohibition-era folk, country and spirituals. 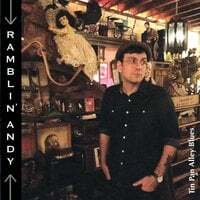 Ramblin’ Andy is a country - blues musician that channels the sophisticated acoustic blues of early 20th Century New York. Often teaming up with long standing Brooklyn country stalwarts, Ramblin’ Andy can be found almost every night of the week taking audiences on a trip back to New York circa 1928. Back to a time when Louis Armstrong and his Hot Five were performing and recording alongside the Father of Country Music, Jimmie Rodgers. Back to Harlem where Lonnie Johnson, Duke Ellington’s guitarist, was performing solo blues between the big band sets and Fats Waller was rubbing shoulders with Irving Berlin. Back down to Greenwich Village, where Josh White, an original Almanac Singer, was a favorite of the Roosevelt’s and a frequent White House visitor. Often misrepresented as country bumpkins, these early country-blues acts were anything but. There’s a reason they were always wearing suits. Ramblin’ Andy embodies these classic New York sounds. He mixes them up and makes them his own. He performs with schooled, urbane, and jazz inflected flair. In doing so, he rejects the tiresome po’ boy caricature that has become so prevalent in modern roots music. With a repertoire that ranges from Big Bill Broonzy to Hank Williams, Fats Waller to Woody Guthrie, there is something for everyone in a Ramblin’ Andy performance. Catch him out and about and take in a show. You won't be disappointed.